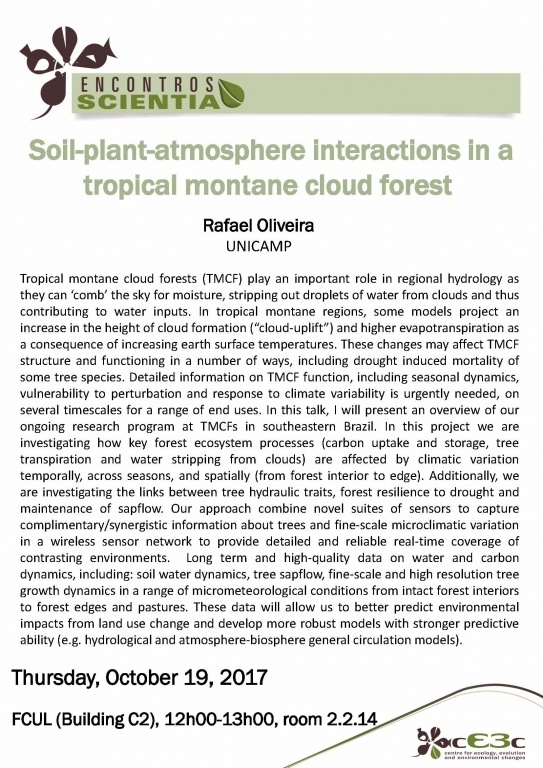 Tropical montane cloud forests (TMCF) play an important role in regional hydrology as they can ‘comb’ the sky for moisture, stripping out droplets of water from clouds and thus contributing to water inputs. In tropical montane regions, some models project an increase in the height of cloud formation (“cloud-uplift”) and higher evapotranspiration as a consequence of increasing earth surface temperatures. These changes may affect TMCF structure and functioning in a number of ways, including drought induced mortality of some tree species. Detailed information on TMCF function, including seasonal dynamics, vulnerability to perturbation and response to climate variability is urgently needed, on several timescales for a range of end uses. In this talk, I will present an overview of our ongoing research program at TMCFs in southeastern Brazil. In this project we are investigating how key forest ecosystem processes (carbon uptake and storage, tree transpiration and water stripping from clouds) are affected by climatic variation temporally, across seasons, and spatially (from forest interior to edge). Additionally, we are investigating the links between tree hydraulic traits, forest resilience to drought and maintenance of sapflow. Our approach combine novel suites of sensors to capture complimentary/synergistic information about trees and fine-scale microclimatic variation in a wireless sensor network to provide detailed and reliable real-time coverage of contrasting environments. Long term and high-quality data on water and carbon dynamics, including: soil water dynamics, tree sapflow, fine-scale and high resolution tree growth dynamics in a range of micrometeorological conditions from intact forest interiors to forest edges and pastures. These data will allow us to better predict environmental impacts from land use change and develop more robust models with stronger predictive ability (e.g. hydrological and atmosphere-biosphere general circulation models).